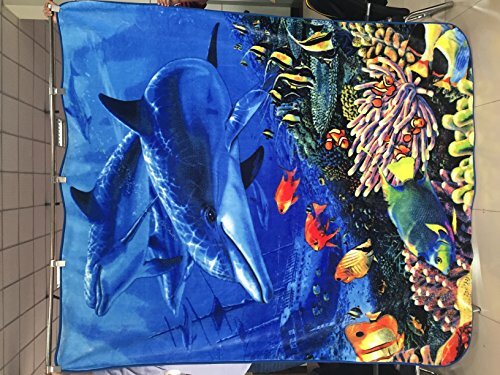 JQ Signature 3KG Heavy Mink Quality Korean Style Queen Size Blanket Dolphins "Shipwreck"
Product prices and availability are accurate as of 2019-04-26 10:30:33 UTC and are subject to change. Any price and availability information displayed on http://www.amazon.com/ at the time of purchase will apply to the purchase of this product. Beautiful colorful luxurious plush and thickthe Dolphin mink blanket from our signature collection is all this and much more. 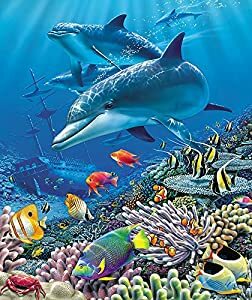 This super soft and thick faux-fur ocean floor blanket features two dolphins in a vibrant under-water world with a shipwreck in the background. It is 74 x 96-inches so it fits a queen or king-sized bed. It also weighs 6-lbs making it one of our thicker heavy-weight pieces. Because it is 100% Polyester it is completely machine washable and will air dry quickly.This means that you can use it as a comforter for your bed as a throw for your sofa or your car and even as a durable camping blanket. If it gets dirty just toss it in the wash and it is ready by bedtime. Wrap your loved one in one of our snuggly mink blankets and you are guaranteed to make their day. This one can easily become the focal point of any room.